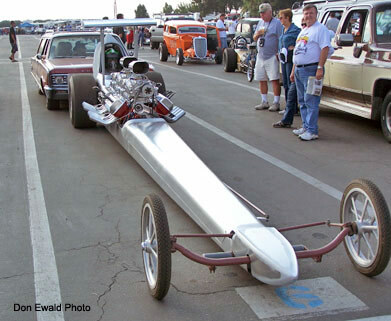 It is said that timing is everything. 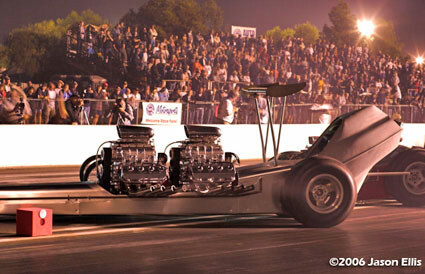 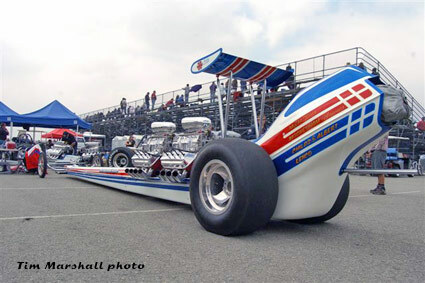 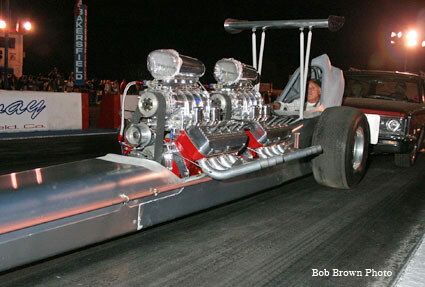 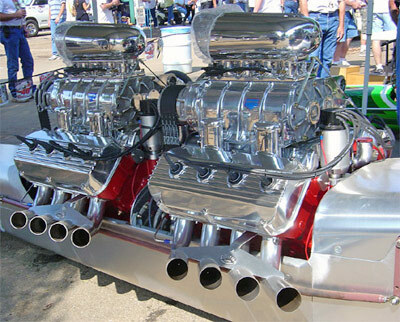 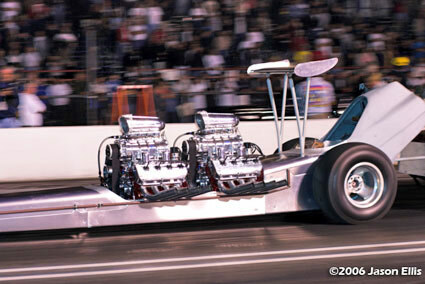 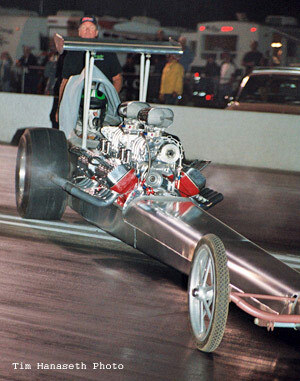 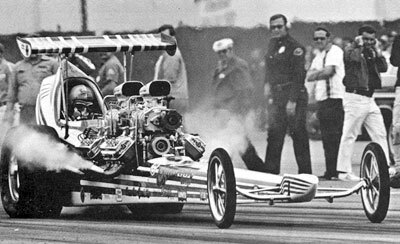 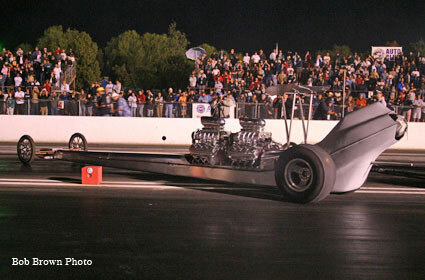 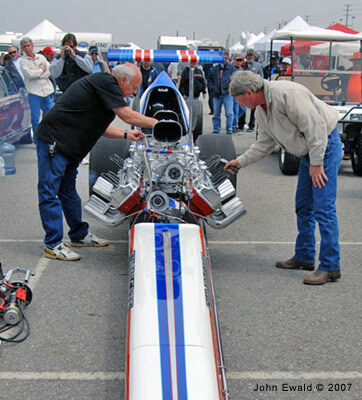 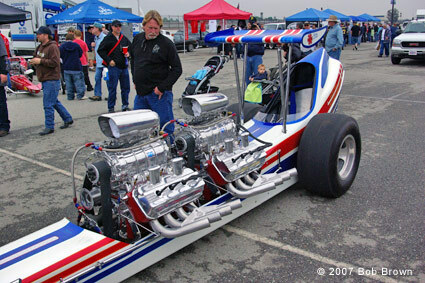 In the case of the last twin engine top fuel dragster ever built, that could be an understatement. 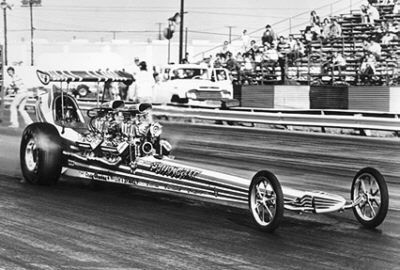 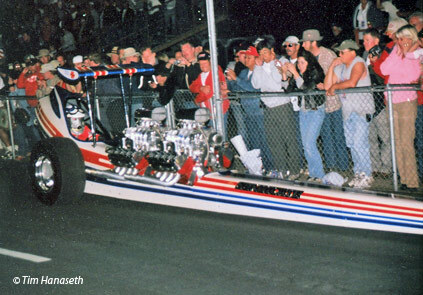 At the time Don Garlits was shaking up the sport with his first rear engine car, the team of Forthmann, Raitt, Butorac and Ditmar were having Frank Huszar of Race Car Specialties build the latest version of a "Syndicate" fuel dragster. 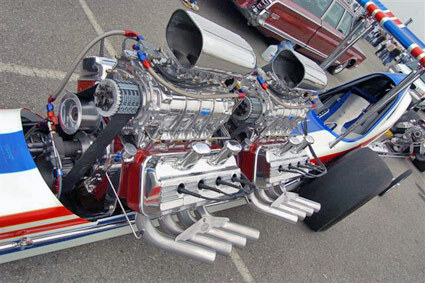 The previous Syndicate cars were all conventional 1 hemi on nitro deals, but in 1971 they, for what ever reason, thought 2 hemis on nitro was a better idea. 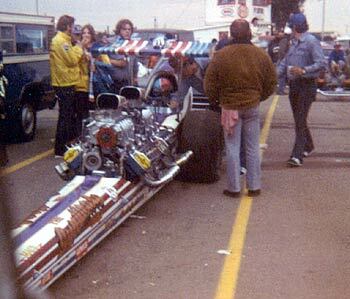 Bless them for their daring venture but in hindsight, their timing was not everything. 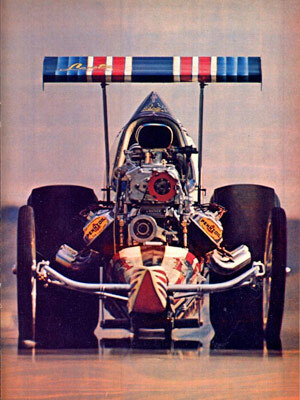 Nonetheless, the team campaigned the car into the 1972 season when it became painfully obvious that rear engine cars were and would forever rule the Kings of the Sport. 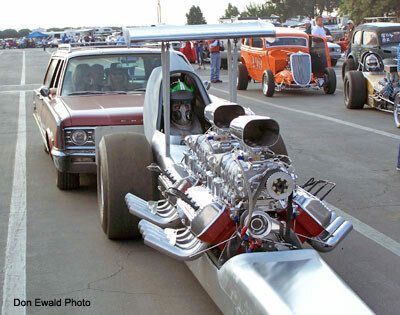 The behemoth was parked and the team disbanded. 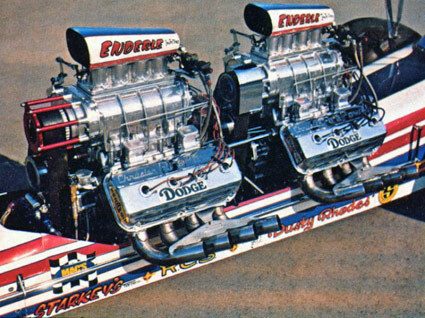 They never went on to build a RED. 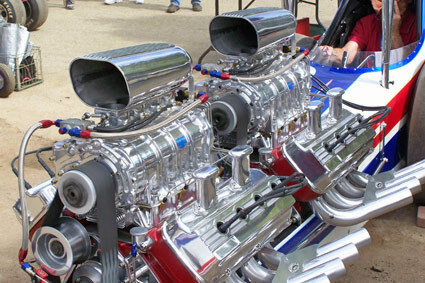 But in its short life, the twice engined Syndicate got more than its share of fan and press attention. 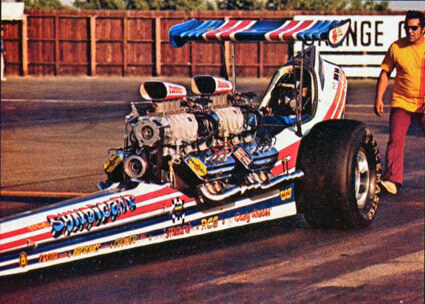 There are no available stats on how quick and fast the car ever ran but even though it was not competitive, it was an awesome piece and for many reasons needs to be remembered. 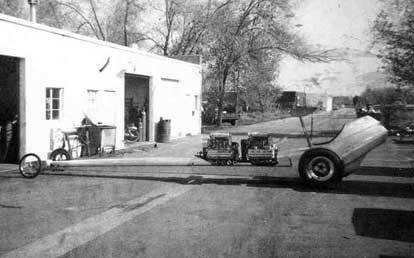 "Syndicate" - AA/FD - nearing completion at RCS in 1971. 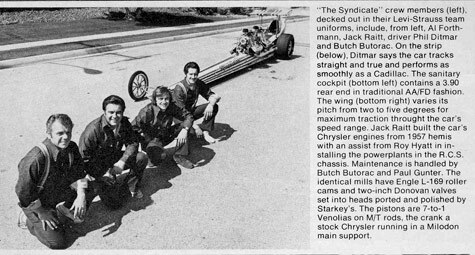 "The Syndicate" AA/FD was a bold undertaking in that they tried to compete with the new rear engine dragsters by putting two early hemis in what was a nice car. 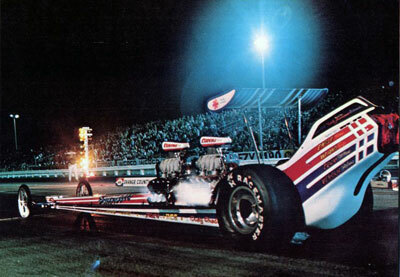 Nice burnout shot at OCIR in 1971. 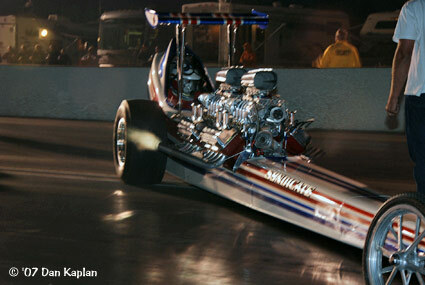 Bob McClurg did a feature story on the car that included this burnout shot in a city parking lot. 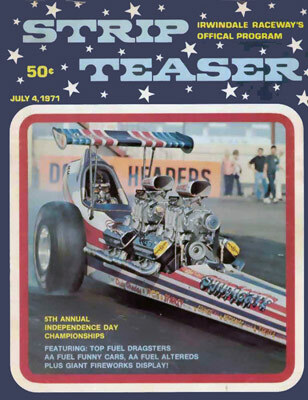 The car made the cover of this Irwindale Program in July of 1971. 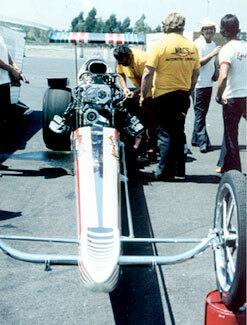 Pomona in 1972. 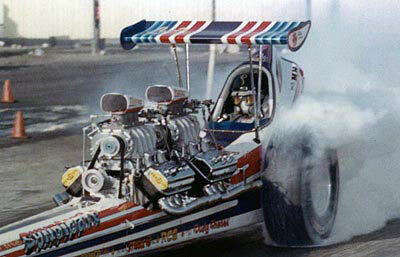 This is one of the last photos taken of the car in action. 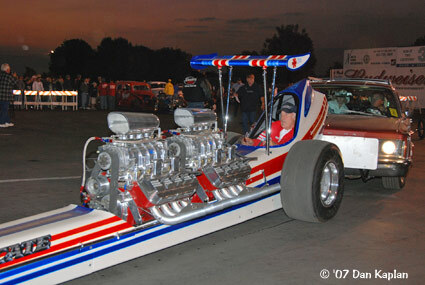 The car is now owned by Ken Blackmore, from Temecula, CA. 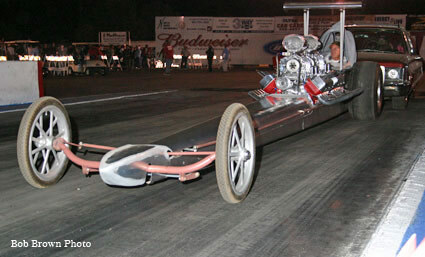 who is a construction company owner and also owns the Poison Ivy cackelcar. 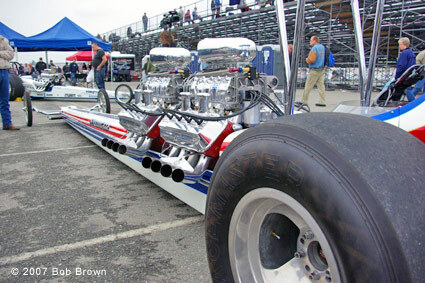 Jay Carpenter is Ken's "Cackle Crew Chief" and takes the cars to events etc. 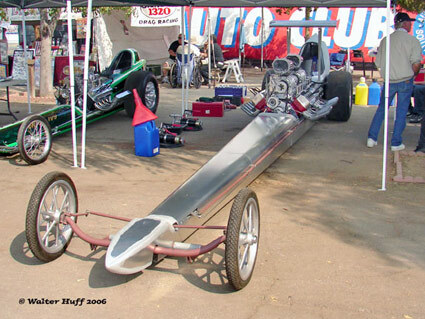 The car made its debut, sans paint and chrome, at the 2006 California Hot Rod Reunion and was pitted in The Grove. 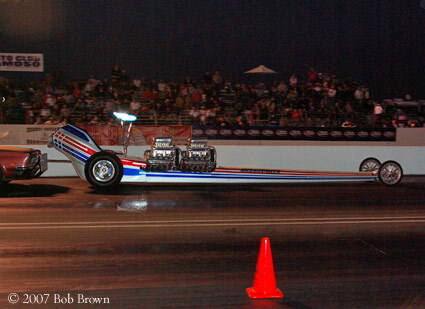 Friday afternoon Jay Carpenter did the mandatory test push start for new cars and/or new drivers in a car. 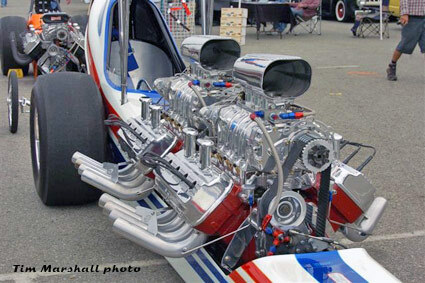 In this case the whole package was maiden. 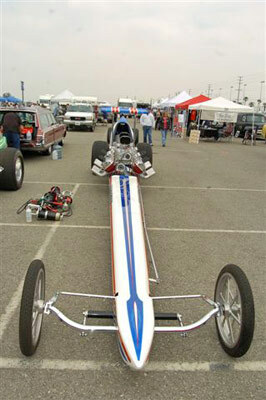 With a successful test push start under their belt the car was Cacklefest ready. 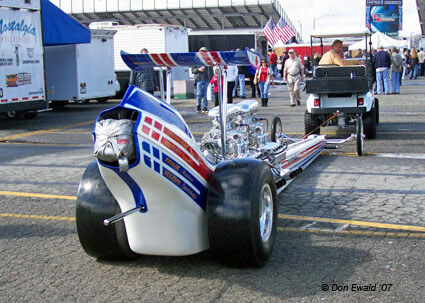 Here they enjoy the pre-Cacklefest parade. 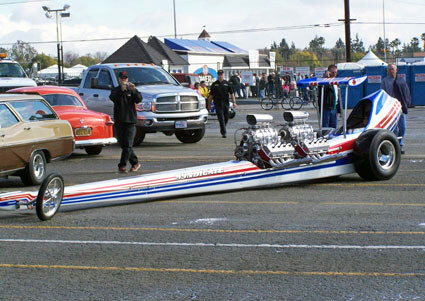 Jay Carpenter looking lost in the cockpit of this larger than life hot rod. 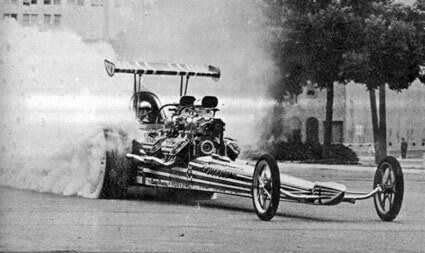 After push starting down the fireup road Carpenter made his turn and drove the car up track to its spot firing on all 16 cylinders. 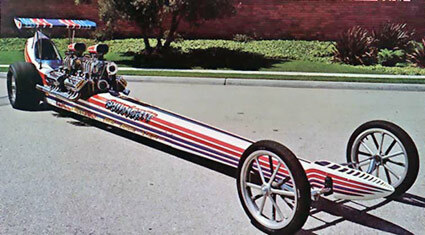 Over the winter the car was disassembled, painted and chromed. 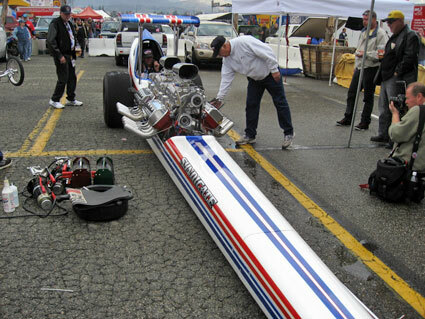 Its first outing was the NHRA Winternationals where a full blown Cacklefest was scheduled for Sunday afternoon but rain put the race behind from the start and the Cacklefest had to be scratched. 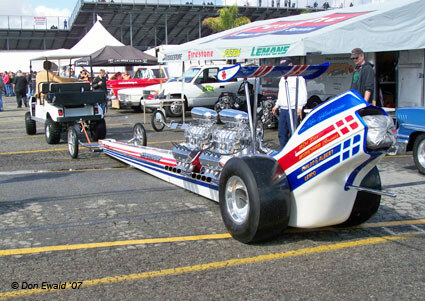 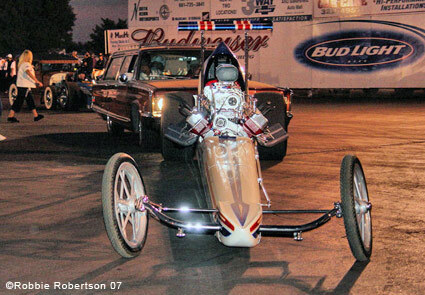 In April the car made an appearance at the Nostalgia Nitro Shootout at Fontana Dragway. 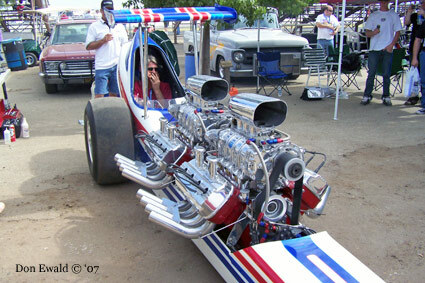 The Syndicate made its 2nd Cacklefest at the 2007 California Hot Rod Reunion and this time it was finished... what a beauty. 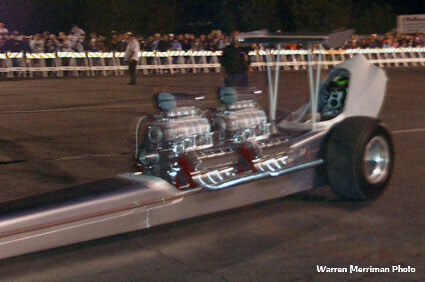 Jay Carpenter fired the two fuel hemis for the fans in The Grove several times over the weekend. 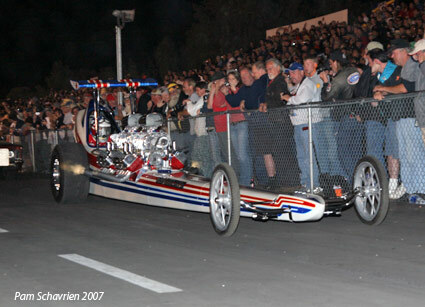 The pre-Cacklefest Parade with Jay Carpenter in the seat. 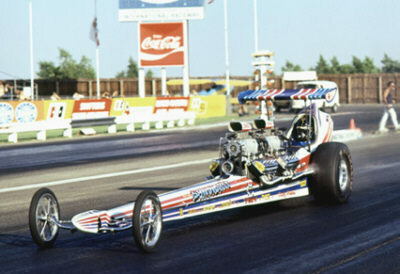 Carpenter in The Syndicate running on all 16.